Happy New Year from St. Louis! 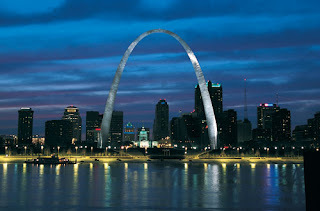 Many people are unaware that it is possible to take an elevator ride inside the famous Gateway Arch at the St. Louis riverfront. 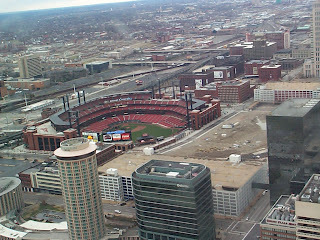 The second picture above shows a view from the top of the Arch, with a view of Busch Stadium, where the (World Series Champion!) St. Louis Cardinals baseball team plays. The tall round building, by the way, is the Millenium Hotel, site of the 2007 National Youth Action tournament! Have a safe and happy New Year, everyone. Ray Robson Does It Again! 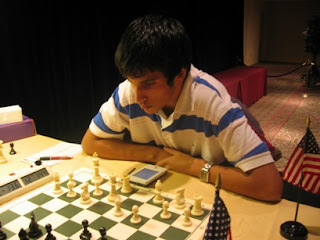 In an earlier post, regarding the 2006 National Chess Congress, I wrote: "A look at the top seven finishers shows 6 GMs and 1 IM. Five of these players sport 2600+ ratings, and another is just below, at 2592. Who is the next player in line, the one who finished in 8th place? 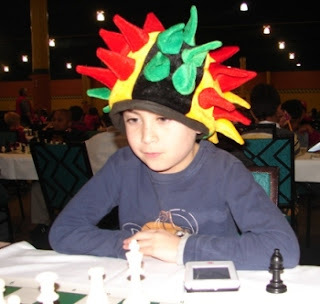 It is none other than sixth-grader FM Ray Robson, with his 2258 rating." Ray has done it again. 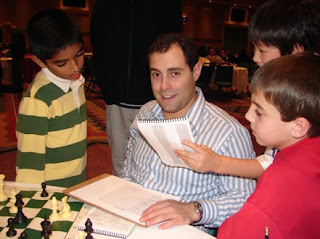 The 2006 North American Open has just concluded and the MonRoi site provides the final standings from the open section. Look at the top 13 finishers. Go ahead, I'll wait. See what I mean? There are nine GMs, three IMs, and FM Ray Robson. He finished tied for 5th-9th place, with a score of 5.0/7, just one point behind tournament winner GM Hikaru Nakamura. In that group of 9 GMs and 3 IMs, the lowest-rated player is still 175 points above Ray. Of his five victories, one came against a 2300-rated player, two against 2400-rated players, and one against GM Melikset Khachiyan, who weighs in at a hefty 2539. Here at the end of 2006, his rating now stands at 2287, 105 points ahead of where he ended 2005. Look for great things from this young player, still only twelve years old. 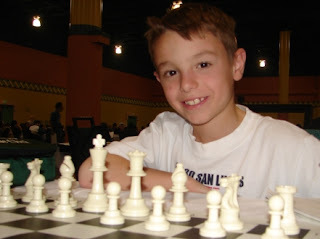 A cute story appears at Simone's Chess Blog. 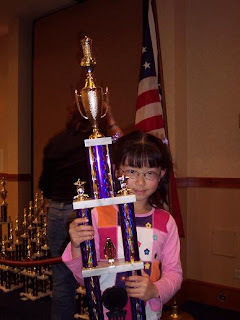 "When I started to play in scholastic tournaments outside my class in April, I was often at the bottom of the sheet looking up to the good players getting nice trophies and dreaming of one day I could just draw one of them," she says. 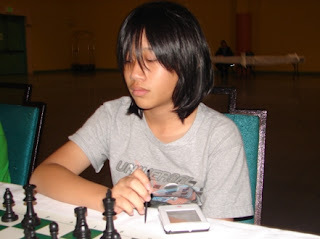 "After 100 or more days of studying and 10 or more tournaments, now I found myself at a position to compete for top spots in open sections of scholastic tourneys. My teacher told me at the beginning that getting into Top US 100 List would take me at least a couple years. Now I have been on it for a couple of times. This all happened in a little more than 7 months." "In one game, I was able to use a basic checkmate technique I reviewed in a book the day before to win a game in 10 moves." See her entry from December 25 for the game! It was a smashing success for the University of Texas-Dallas (UTD) as the UTD-A and UTD-B teams captured the top two spots in the 2006 Pan American Intercollegiate Championship, with the University of Maryland-Baltimore County (UMBC) close behind in third place. A total of 24 collegiate teams competed. In the scholastic section, A. Balasubramanian took first place with a 5.5/6 score, followed by Raja Panjwani (5.0/6) and Edward Lu (4.5/6). There were 20 participants in the scholastic section. 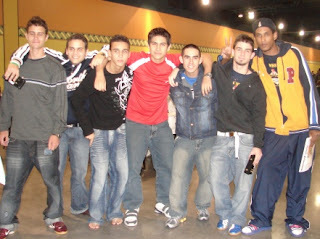 For more information, see the MonRoi site or the official 2006 Pan American Championship website. Why are Rooks Better than Bishops? 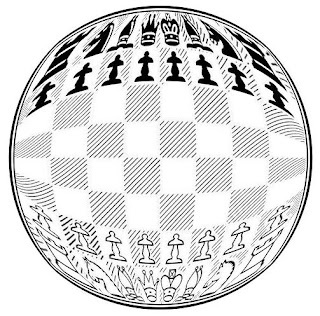 Most of the basic chess instruction books tell us that knights and bishops are worth about three "points" or pawns, while rooks are valued at about five "points" or pawns. Of course, this is relative, and in any given board position this valuation may vary considerably. But in general, it holds true. We can easily understand the rook's greater value than the knight, which moves slowly across the board. But what about the bishop? Like the rook, it can quickly scoot from one end of the board to another. Why should it be worth so much less than the rook? Have you ever pondered this or just taken for granted what the books tell us? Look at the board below with only rooks. No matter where a rook is positioned, it can potentially attack 14 squares. This is true whether it sits in the middle of the board or right at the edge. Now take a look at the "bishops only" board below. At best, a bishop can hit 13 squares, if it sits on one of the four center squares. At the edge of the board, it can only attack 7 squares! There are two other reasons why rooks are generally superior to bishops. First, a bishop is limited to only one color square, so it is forever off-limits to half the board. And second, while bishops side-by-side can be strong, they are not as devastating as doubled rooks can be. The Chess Drum reports that principal, teacher and chess coach Salome Thomas-El has won Philadelphia Magazine's 2006 Best Philadelphian Award. The impressive eight-page spread in the magazine can be viewed here. 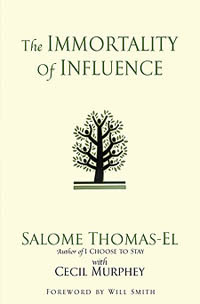 Thomas-El recently penned the book The Immortality of Influence, with a Foreword written by television and movie star Will Smith. 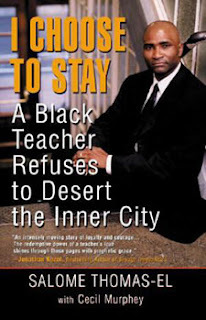 His previous book I Choose To Stay is the inspiration for an upcoming Disney movie. Kudos to Dr. Daaim Shabazz of The Chess Drum for an excellent report. 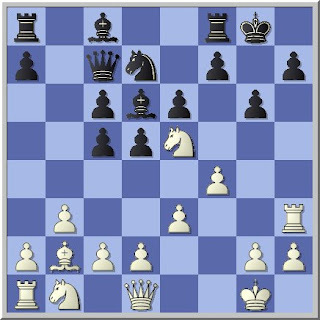 You can find a nice position analysis article at Chessville by IM Igor Khmelnitsky. He looks at a position from a recent U.S. Chess League game and succinctly explains how the winning side can proceed, then follows up with analysis of three similar positions. 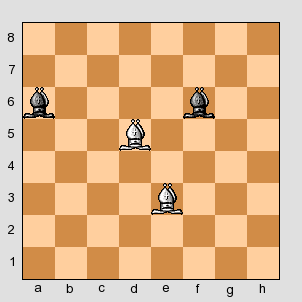 It's White to move and mate in three. This is a pretty one! 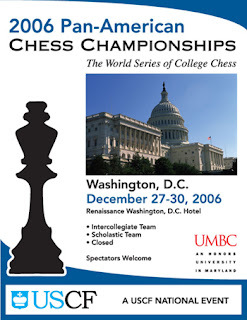 The 2006 Pan-American Intercollegiate Team Chess Championship, also known as the "World Series of Chess," takes place December 27-30 in Washington, D.C. Updated coverage is available at MonRoi. 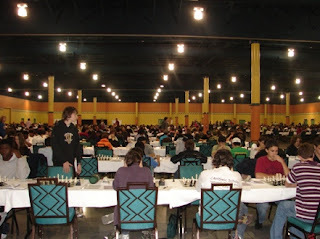 The 2006 Pan-American Scholastic Team Chess Championship will take place concurrently. Start a College Chess Club! 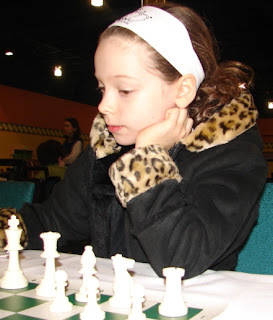 An instructive "how to" article has been posted at Susan Polgar's blog, written by Gregory Alexander, Associate Chair of the College Chess League (CCL). It describes in detail how to begin a chess club at your college or university, from the ground up. "All it takes is one to leader to get your club off the ground," he says. "Don't worry about your playing strength," he continues. "It is much more important to have a solid organizer lead the club than someone who plays a strong game of chess. What is needed is good leadership." A comprehensive list of university chess clubs is available at the CCL Community Page. 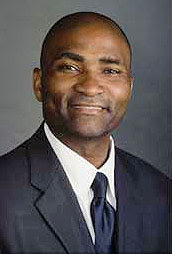 For more information, Gregory can be contacted at gregorya@u.washington.edu. "Garry Kasparov says one step to becoming a strong player is to play and annotate approximately 300 games versus strong players. I'm considering strong players to mean GMs. Here is my complete tournament history versus GMs. I will try to continuously update the analyses of these games and, as always, welcome the comments of others." Not all of the games are accessible (links not present), but there are a number of annotated games available. Click here for the relevant page from his website. A nice recommended chess reading list categorized by rating is available at the Chess for Beginners blog. It doesn't include any DVD material, of which there is quite a lot. It also doesn't mention (in the referenced blog post) the absolutely vast amount of free instructional material available on the internet. For a small sampling, check out some of our links listed on the right side of this page. Here is a video clip from a Philadelphia TV station showing an event sponsored by the Police Athletic League, pitting the city's police and firefighters against each other in an interesting game of chess. You'll find that the pieces are a bit larger than normal! 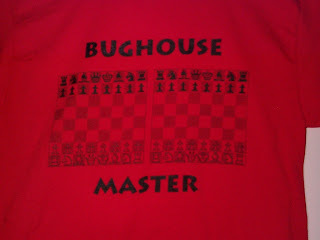 Scholastic Chess Gateway named Hot Blog of the Week! The Chess Live Wire, the weekly newsletter of Chess Live, has chosen the Scholastic Chess Gateway as its Hot Blog of the week. See the notice in the December 22, 2006 edition of their newsletter! Thank you to all of our readers and to the Chess Live staff! You can find additional coverage of this match at Amity Chess Academy, ChessBase and Susan Polgar's blog. In this 5-minute cartoon, the heroine Princess Natasha joins the chess club at school and with the help of her grandmaster cohort, saves her country of Zoravia just in time. In this man vs. machine episode, the human side comes out victorious! Home for the holidays and looking to spend some time working on chess? Try these links below for enough annotated games to keep you busy for the entire holiday (and then some)! Best of The Kenilworthian - contains dozens of annotated games! 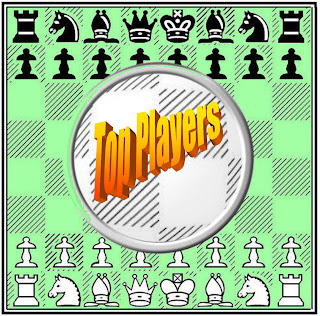 Chessville Annotated Games - it might take you the full 24 hours just to count the number of annotated games here! The second day of rapid games (game/25 + 10 second increments) began with Lahno winning her fourth consecutive game, but Negi stormed back with victories in the final two games of the day. The match concludes with six (!) blitz games on December 25, with the current score Lahno 7.5/12 and Negi 4.5/12. 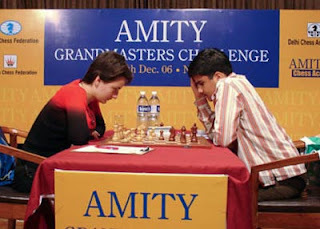 The main website can be found at www.amitychessacademy.com. You can also find interesting coverage of the latest games at the ChessBase site. Game 6, the final "classical" game in the match between the world's youngest GM and the world's youngest WGM, ended in a draw by three-fold repetition. You can see the game here. 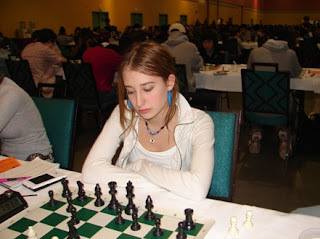 GM Susan Polgar has some interesting comments about this match at her blog. 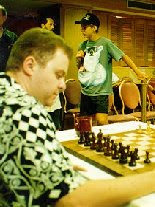 Current Michigan co-champion Tim McGrew is a university professor and chess coach, Internet Chess Club administrator, and author of multiple columns at ChessCafe, Chess Life, The Chess Correspondent and Michigan Chess. Tim has kindly allowed us to publish one of his many helpful chess worksheets, labeled Pattern Recognition. It is intended for beginning students but can also serve as a quick review for intermediate players as well. 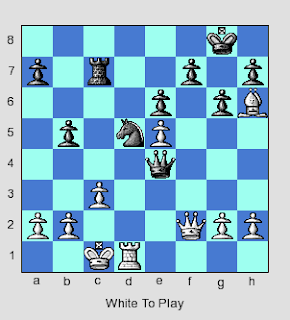 The seven-page pdf file ends with positions from six actual games in which the reader is asked to find a winning move, based on the patterns McGrew has discussed. You can find his Pattern Recognition worksheet here. Reader Tom Chivers of the blog http://streathambrixtonchess.blogspot.com/ points out where you can find a free pdf file file (110 pages!) discussing a series of secret training games by Botvinnik. When you have a few minutes (or a few hours), take a look! And take a look at Tom Chivers' blog, noted above. He's got a lot of good material. 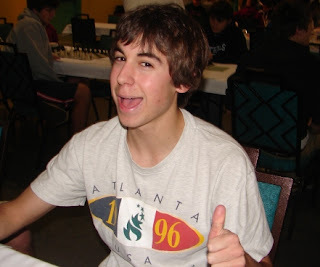 16-year-old Jonathan Hilton (rated USCF 2163) presents a nicely-done essay analyzing the Catalan opening, as played by the late GM Alex Wojtkiewicz. It includes six heavily annotated games presenting different variations of the Catalan, as well as one of Hilton's own games. You can find Part One of the essay at Chess Life Online. The fifth game of this match reached a classic opposite-color bishop ending in which Negi's extra pawn was useless. 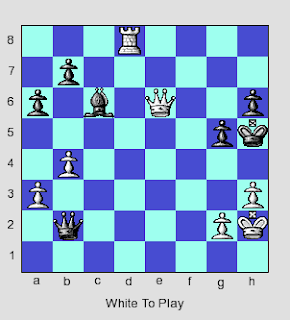 The final position is instructive in how to negate your opponent's material advantage in such situations. Note: the Blogger platform has been having some technical problems; if the video doesn't appear, you can find it here. 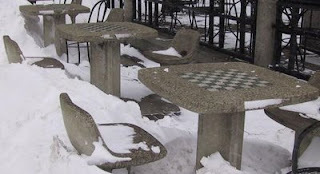 "Chess Principles and Common Sense"
One of my favorite chess columns is Dan Heisman's Novice Nook, available at ChessCafe. Click here to see his latest column, placed online today. See his homepage for a variety of useful information. 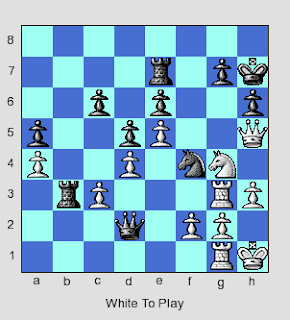 The fourth game of the ongoing Negi-Lahno match is a draw, featuring an unusual variant of the Ruy Lopez in which Black deliberately breaks up her protective pawn structure surrounding her king. You can find the interesting game here. In the ongoing Negi-Lahno youth GM-WGM match, game 3 ended in a 43-move draw. Click here to see the game. For a nice annotation of this game, see GM Susan Polgar's blog. There are still three more "classical" games to be played in this series before they move on to the rapid games on Dec. 23. Six "classical" games with tournament time control, from Dec. 17 through Dec. 22. Six "rapid" games over two days, Dec. 23 and Dec. 24. Six "blitz" games, all on Dec. 25. The primary website for the event can be found here, and game results, as well as game scores, can be found here. 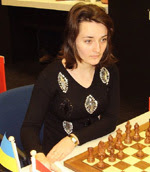 The first game was drawn, but the second was won by Kateryna. Click here to view the game. You might also want to check the William Harvey puzzle site, which has several tactical puzzles from Kateryna's games. Dr. Alexey Root interviews GM Susan Polgar in the latest issue of Chess Life magazine, and it has some surprises! The Grandmaster explains her philosophy in teaching chess to small children and annotates a game from her son Tommy. Dr. Root also offers ten suggestions from her husband IM Doug Root for helping young children to learn chess and enjoy their earliest experiences. One of his interesting thoughts: "Play checkers to help your child develop strategy." 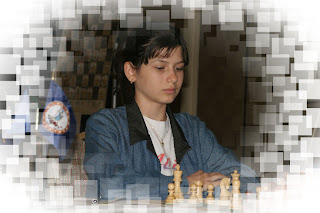 You can find her story at Chess Life Magazine online. 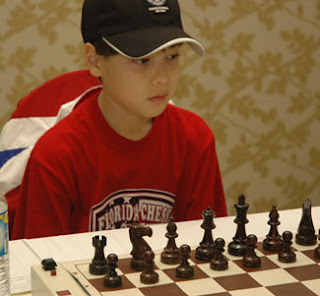 As mentioned in an earlier post, Polgar's son Tommy won the Grade 2 section of the recent National K-12/Collegiate tournament in Florida (her younger son Leeam also has begun playing chess). Click here to play his final-round game that netted him the championship. For an easy search of chess tournaments throughout the U.S., check out the Online Tournament Announcements page of the USCF website. For an interesting article about what tournament registration and tiebreaks have to do with each other, click here. Don't see a tournament in your area? How about holding one yourself?! 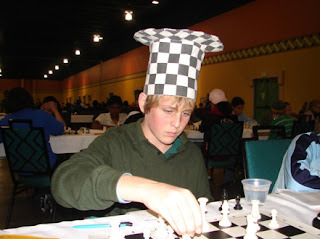 The Washington High School Chess Association offers a helpful article describing elementary school tournaments in Washington State, but the information is useful for the neophyte tournament director anywhere. 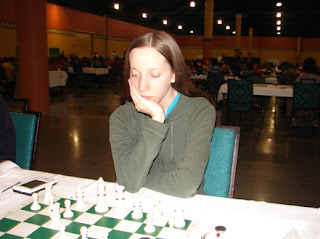 In addition, the United States Chess Federation offers extensive information here, including an informative "Step by Step Brochure on Running Your First Tournament." Getting ready to attend your first tournament? See National Master Dan Heisman's helpful article here. Did you miss our inaugural newsletter? Click here to see a web version (not quite as nice as the e-mail version but with all the same information and links!). 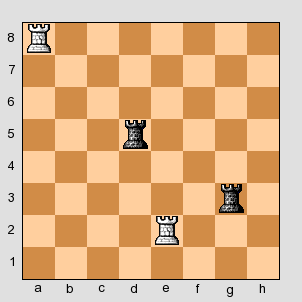 It's White to move. What would you do? For the beautiful solution(s), click here. Locate a Chess Club Easily! Great Deal on Chess Shirts! All in-house shirts, from our sponsor PIC Products, are on sale through the end of December for $9.50 each (regularly $14.99), plus a flat $4.00 shipping/handling regardless of quantity. Customization available at no additional charge. For more information and any restrictions, e-mail wendy@picproducts.net or call (314) 908-1181. For a wonderful photo essay regarding the recent National K-12/Collegiate tournament, see Elizabeth Vicary's excellent online article here. She describes some strange forfeits at the top boards and includes a game by a player whom IM Greg Shahade is quoted as calling "a huge, huge talent, easily one of the most promising juniors in the country." He played some of the greatest chess players in history, and he turns 95 on Sunday, Dec. 17, 2006. 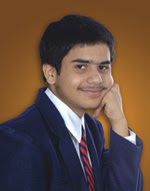 Find out who he is here. 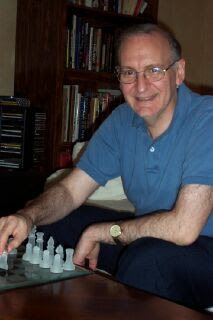 Michael Goeller of The Kenilworthian writes about new chess articles at IM Jeremy Silman's website. You can read Michael's excellent report here. By the way, Silman's book The Amateur's Mind remains one of the most instructive chess books I've come across. You can read a review of this book by Randy Bauer here. In an interesting ratings update article at the USCF website, IM Greg Shahade explains how a number of players' ratings moved up or down despite no recent chess activity! See the article here. Where can you get a quick-read free weekly e-mail chess newsletter? 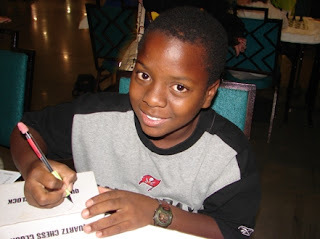 One where you can quickly scan a few of the latest Scholastic Chess Gateway blog entries? Where you can get quick links to some of the most interesting websites? With a tactical puzzle, and where it takes 60 seconds to scan the whole thing (30 seconds if you're good at blitz!)? Right here! Just send an e-mail to scholasticchess@gmail.com, with "Subscribe" in the subject line, and it'll be on its way soon! The first edition is fresh off the press - get it before it gets stale! My December ChessCafe column is now online! You can find it here. No Captures Until Move 51 ! 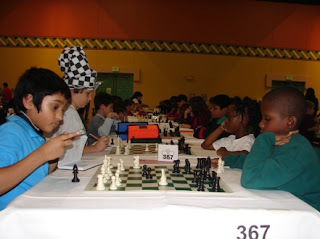 A reader reported that at a recent tournament, a game between two talented middle school players went until the 51st move before ANY material was captured! Does anyone else have similar games to report? If so, please send the game score! 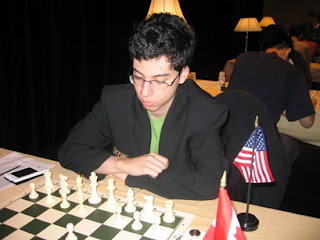 Pan-American Intercollegiate Team Championship - the "World Series of College Chess"
The two team championships are open to college or scholastic teams from North, South or Central America. 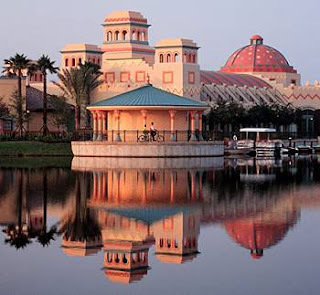 The Pan-Am Closed event is actually open to all coaches, faculty, alumni, and any other members of any college or scholastic delegation who are not already playing in either of the other two events. 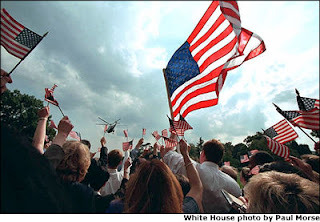 All of the tournaments take place in Washington, D.C. Additional information is available here. The prize for the biggest upset went to 9th grader Nikolas Baeza, rated 572, who in the second round defeated his opponent who was rated 1742, a whopping 1166-point difference! Looking for an easy way to find all of our puzzles? Click here to see them all! Results of the 2006 National K-12 are posted here, although as of this writing, some information still has to be updated. Congratulations to all of the players who participated in the tournament's many events! We'll have more to report shortly.